London Tube, Bus, Black Cab, Underground, Getting Around London,Tube, Bus, Black Cab, Underground, Getting Around London. You can get around London using the Tube or Underground (Subway), taxis (Black Cabs), buses and private limousine services. By far the easiest and least expensive way is the Tube. If you're interested in walking or bus tours of the city, click to our Tours of London page. If you want to sightsee from the Thames, click to River Cruises. 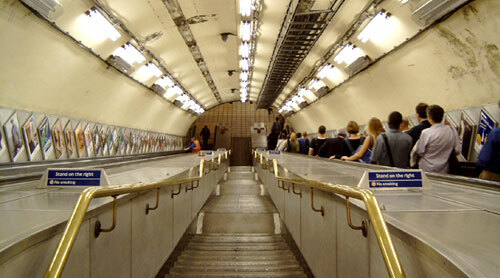 If you don't mind walking, the Underground or Tube is the fastest and cheapest way to get about London. It's also a great way to learn about the city and it's neighborhoods. The map of the Underground/Tube takes considerable liberties with proportions and scale and it's a graphic arts icon for precisely that reason. Use it to navigate underground only. Each Underground line is represented by a different name and colour. At each station, you can use the color-coded signs to find the line you want. The Underground has been subdivided into 6 fare zones. The price of your ticket depends on how many zones you travel through. You can buy tickets from a ticket machine if you know what you are doing. This is an acquired skill, but once you know how the machines work it's easy. You need the right coinage and we recommend that you avoid learning the machine during rush hours (8- 9.30AM and 5-6.30PM, M-F). At first, we recommend that you use the ticket offices. You can buy a ticket for a one-way or (single) ticket or a round trip (return) journey ticket. You can also buy day passes good for travel in as many zones as you like for a day or more. The city centre with Buckingham Palace and Tragalgar Square and many of London's major icons and attractions is in Zone 1. Once you have a ticket, you're ready to go. Most stations in Central London, have ticket gates with automatic ticket readers. You insert your ticket into the reader slot (face up) and it passes through the reader and pops up for you to retrieve and walk through the turnstile gate which opens automatically. It's easy. If your ticket has expired, it will not be returned to you. We suggest that you wear comfortable shoes and "Mind the Gap" when entering and exiting the cars at the station. Also, watch yourself on the escalators, they move fairly quickly and are often crowded. Stand to the right and hold the handrail. NO smoking on the Underground. DON'T litter the stations or trains. WATCH OUT for pickpockets as you would in any crowded public place. PAY ATTENTION and mind the Underground staff in case of emergency. The Underground runs until approximately 12.30AM. After that you can use a Black Cab or buses to get about. Nearly all night Buses pass through Trafalgar Square and serve theatres, cinemas and entertainment areas. The new smaller black cabs are everywhere. 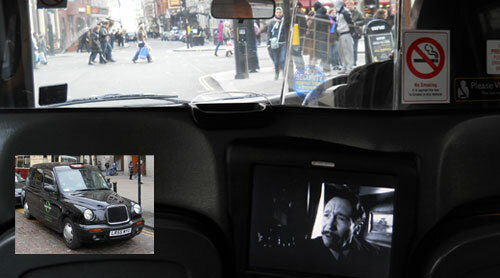 Some even have televisions inside if you get bored looking at London during a traffic jam. Fares start at �2.20 when you get in and you get charged for standing still. Black Cabs All of London's Black Cabs are licensed by The Public Carriage Office and all drivers must apply to do "The Knowledge". This means they must have an in depth knowledge of the topography of London, (no small task). For All London "Green Badge" holders, they must have detailed knowledge within a six mile radius of Charing Cross, the ancient center of London, based on 400 routes as defined by the Public Carriage Office "Guide to Learning the Knowledge of London" (the 'Blue Book'). They also need to know the places of interest and important landmarks on the route and within a quarter mile radius of both start and finish points. Candidates are tested on the knowledge during one to one interviews (called appearances) where they are given start and finish points and required to detail the shortest routes between them. All this goes to the point that Black Cabs are safe to take anywhere in London and the drivers, if you can understand their accent, can answer most of your questions. Unlicensed mini-cabs are cheaper than black cabs, as you would imagine, because anyone can be a mini cab driver; no test, no knowledge, no meters. For these reasons, mini-cabs are not allowed to stop and pick you up on on the street. You have to phone (ring) them and tell them where to pick you up, or "collect you". Minicab touts abound in Soho, Theatreland and other busy tourist areas. They will try to get you into a cab that's waiting round the corner. We recommend you avoid them at all costs. Taxi touts hand about at railway stations and airports. They'll offer to call you a cab or carry your bags. Just say NO. Taxi touts are totally illegal. Remember, unlicensed mini-cabs cannot pick you up on the street. In most cases, these touts will try to get you into a private car. Again, absolutely refuse. Just take your bags and walk away. 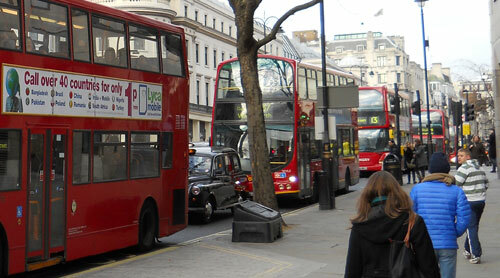 London Transport buses, the famous red doubledeckers, are everywhere in London. They stop at 17,000 bus stops and offer great views of London and its attractions, monuments and landmarks. The Bus network has one fare zone for all of London. Cash is not accepted on buses, so make sure you have a Visitor Oyster card. Children under 12 are free. Buses are safe, many have video cameras on board, and all of them have two-way radios. Be careful getting on and off. Wait for the bus to come to a complete stop. To get off, ring the bell once and give the driver some warning. Also watch yourself when crossing the road since buses sometimes drive in special road lanes against the traffic flow. Night Buses pass through Trafalgar Square and serve theatres, cinemas and entertainment areas. Night buses only stop if you ring the bell, othewise they just keep driving. You can pick up a credit card sized timetable and a Night Bus booklet at travel information centres, some newsagents and major Underground stations. Night Bus fares are slightly higher than on day buses and they don't accept one day tickets or Family Travelcard. Children pay adult fares after 10PM too. We defintely don't recommend that you rent a car and drive in London unless you know the lay of the land and are used to driving on the left. London drivers are unforgiving and that's putting it mildly. If you choose to get about the city by car, we recommend that you hire a driver for the day. It may seem expensive, but can actually be cheaper than using a Black Cab. Private cars for hire provide a highly personalised service, are more comfortable vehicles and there's no waiting around for an empty taxi to turn up. Hiring a car you will avoid a lot of problems that could absolutely ruin your day. 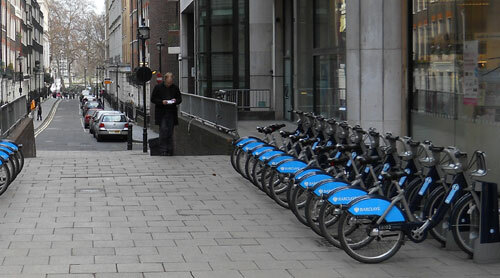 The Barclays Cycles program (scheme) began in July 2010 and is similar to the bike rental program in Paris. It is now the Santander Cycle Hire program. You can hire a bike from as little as £2. Simply go to any docking station with your bank card and touch the screen to get started. Take a cycle, ride it where you like, then return it, ready for the next person. The bikes are available 24 hours-a-day, all year round. It's self-service and there's no booking. Just turn up and go. For more information, click here.